Fanny Brice: [looking in the mirror] Hello, gorgeous. 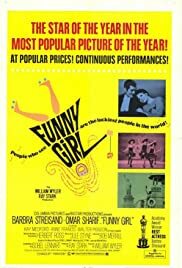 Quite simply, Barbra Streisand's extraordinary, scintillating Oscar-winning debut in this classic is one of the finest musical-comedy performances ever committed to celluloid. Better than that...I'd venture to say that alongside Vivien Leigh's masterful performance in "Gone With The Wind," Barbra's portrayal of vaudeville icon Fanny Brice may be one of the most ambitious, captivating turns by a lead actress ever captured on film. Even Barbra-phobes would have to concede that the woman completely knocked herself out with "Funny Girl" and her renditions of "I'm The Greatest Star," "My Man," "People" and especially the pulse-jolting "Don't Rain On My Parade" rank right up there with the best of Judy Garland ("Over The Rainbow," "The Trolley Song" and "The Man That Got Away."). Because Streisand has been an exalted Hollywood legend for many decades, people tend to almost take her remarkable talents - both as an actress and as a singer - for granted now but this opulent musical, sparkling score and her thrilling, take-no-prisoners performance will endure as a testament to what pure show business, high octane theatricality and legitimate talent are all about. Sing Proud, Barbra!